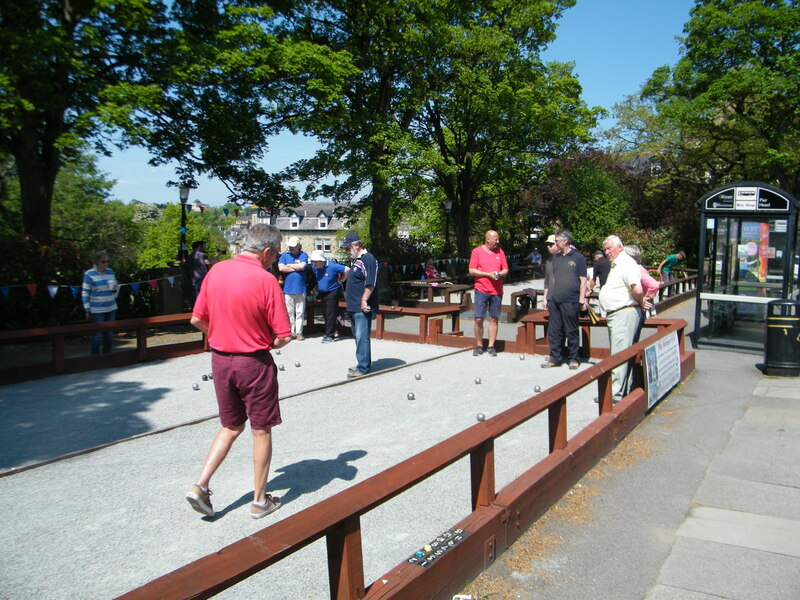 To avoid confusion Pétanque and Boules are one and the same, and there are several other sports around the world from the same origins – as are lawn and crown green bowls. The game of rolling or throwing balls at a target can be traced back to at least Ancient Greece. The iconic image of Sir Francis Drake playing ‘bowls’ on Plymouth Ho, awaiting the arrival of the Spanish Armada was probably more akin to ‘pétanque’, and the most likely source of the projectiles was as ‘cannon balls’! The aim of each play is, by the end when all the boule have been thrown, to have your boules closer to the coche (jack) and score points for the number that finish closer to the coche than the first of the other teams’. So the team winning the toss can decide to throw the coche (jack) at least 6 metres from the point where they are standing, and no more than 10 metres. The coche is either wooden or plastic, and is about an inch in diameter. Boules are metal and can vary slightly in weight, diameter and hardness. Both diameter and weight are a matter of personal choice governed by hand size and strength. The team throwing the coche, have the first boule to get as close to the coche as they can. Boules must be thrown underarm and usually with the hand on top, as in the picture. This mean that when you release the boule, when the arm is about horizontal, you create backspin to control the distance it rolls. The other team throw their first boules and will continue to throw until they are closer to the coche. Aiming and throwing at the coche is called ‘Pointing’. The alternative, if the opponent is very close to the coche, is to ‘Shoot’ their boule out of the way. Once both team have thrown all their boules there is a check and measure to agree the number of points that the team has scored for their boules closer than the nearest of their opponents. A game is the first team to 13 points. Pointing is a relatively natural skill, based on hand/eye co-ordination and most beginners can be playing a competent game within a few minutes of picking up a boule. Because of the nature of the terrain as a rough, uneven surface, tossing is a more reliable action to rolling. It is also similar to putting in golf, where you read the contours and borrows of the piste to ‘find the line’. Shooting is a far more acquired skill to be pin point accurate to hit a 3 inch target from up to 10 metres. But very rewarding when you do!